See a variety of wildlife on a swamp boat ride and explore an authentic southern plantation on this tour from New Orleans. See alligators, egrets, raccoons and snakes during your ride around a private Louisiana swamp after taking a tour of Destrehan Plantation, the oldest documented French Colonial style house in the Lower Mississippi Valley. 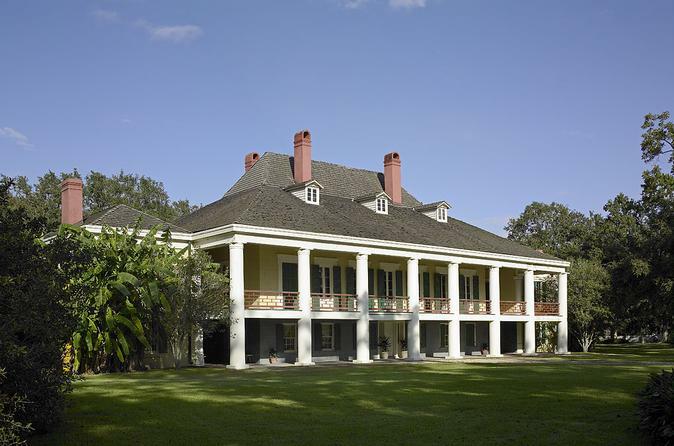 Your tour will begin with a tour with a 1.5-hour visit to Destrehan Plantation, where you will learn the history of the Destrehan family sugar dynasty, see a Slave Revolt Museum that dates back to 1811, and admire the architecture of a French Colonial style plantation. After your plantation tour, take a comfortable coach in central New Orleans and ride across the Mississippi River to Manchac Swamp, where you'll board your custom-built, covered boat. This Louisiana swamp is privately owned so you'll be able to take in your fascinating surroundings with fewer distractions. In addition to sharing some local history, your guide will explain why wetlands like this one are disappearing and what's being done to save them. Feel free to walk around your boat to capture photos of the swamp's abundant wildlife, including alligators, egrets, raccoons, snakes, and nutria -- a giant rodent. Your 5.5-hour tour of Louisiana's colorful scenery and history concludes at its starting point in New Orleans.